My People is a feature expected in Windows 10 Fall Creators, and has been acclaimed as a single point of contact for friends, tailored as a hub for your three best friends placed right in the taskbar. 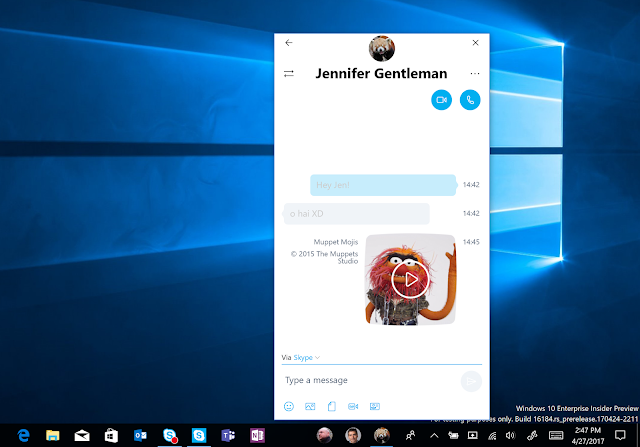 The Windows 10 My people is a fulcrum of Web Mail and social feed, whereby a user can send email to anyone, or chat with millions of other users via Skype. Albeit, the My People experience for now focuses on just three of your friends; as a concept it connects every aspect of reaching all of your friends, but not fully implemented in the beta release. Microsoft officially unveiled My People feature as part of Windows 10 Insider Build 16184, and with the novelty in how friends can respond: “Shoulder taps” pop up emoji right from the taskbar, allowing you wave a hello. It focuses the existing People, Mail, and Skype apps into a unified experience, while allowing only three contacts for now, at some point presumably users will be able to choose many more contacts. If you wish to give the new feature a spin, you’ll need to download an Insider build, or just wait for the Fall Creators Update around September. To kick off the experience after downloading, simply click on the People icon on your taskbar, down in the lower right-hand corner. And when you click the My People icon for the first time, Windows will begin the setup process, listing out your five most popular contacts. However, you're allowed to add contacts through the separate People app within Windows 10, or create an entirely new contacts from scratch.